Many aftermarket shops will tell you that Porsche leaves nothing on the table when it comes to performance. In the case of the new 911 Carrera and its siblings that is probably true. But what about baby brother? The Boxster and Cayman were envisioned as a lower-priced model to bring new customers into the Porsche family. Since 1996 the small Porsche has been a mid-engine design with less power than the 911. With the arrival of the new 718 series Boxster/Cayman, a new turbocharged flat-four is rated at 345 horsepower at the crankshaft. It makes 310 lb-ft of torque, which is more than most V6 engines. While this may be enough for the average driver, the masters at TECHART couldn’t resist digging into the new 2.5-liter. If you have seen their builds in person, you know their level of dedication. It is first noticed with the integration of their body parts. A new front bumper has an integrated chin spoiler that is functional and subtle. The Aerokit also drops the ride height by an inch all around. Progressive rate springs will soften the ride without sacrificing grip. Two choices for rear spoilers will keep you and your significant other happy. Staggered-width 21″ forged wheels are lighter than the factory with a bit more style. All the body parts are made of carbon fiber in Germany by TECHART. They can be glossy or matte or painted to order. Behind the seats is where the real magic happens. The 2.5-liter engine was new for 2015 when it debuted in the 718 series. Unencumbered by any past compromises, it arrived with a more advanced cam timing system and a turbo that made power all the way to 7,500 rpm. It proved to be such a good performer that it had to be detuned to keep from competing with the base model 911 Carrera. We knew someone would step up and release the true potential of the 718 series, but Porsche doesn’t like outsiders cracking their secrets. It would be easier to mine for Bitcoin than crack a Porsche computer, but it has been done. In developing the Powerkit, they were able to achieve 354 lb-ft of torque at only 2,800 rpm. That is more torque than a Ferrari F430, which has four more cylinders. TECHART also found 400 horsepower, and both measurements were made at the rear wheels. But wait, there’s more! The system’s full power can be accessed by using the original sport button on the center console. Every aspect of the upgrade has been engineered into the factory electronics. You will be at 62 mph in 3.9 seconds, the same time as a 911 Carrera S. For the ultimate sleeper, the exhaust upgrade can be installed with factory tailpipes to catch your opponents off-guard. 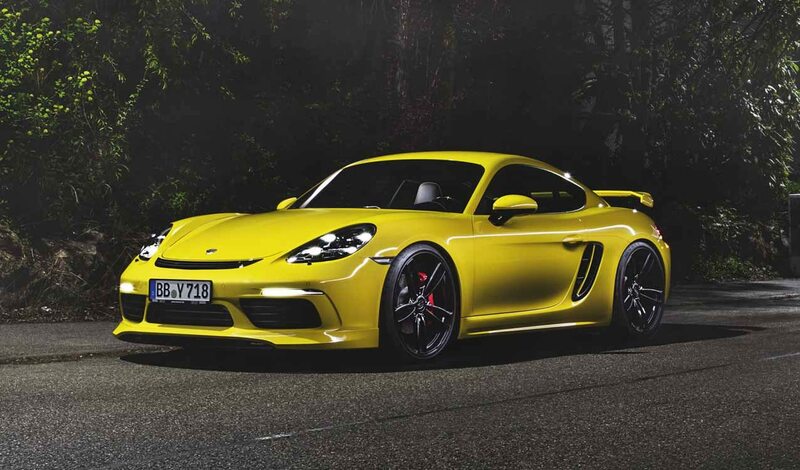 With the equivalent power of a V8 and a top speed of 184 mph, a TECHART tuned Boxster or Cayman is money well spent.